Further fine tuning the concept of a full-fledged multimedia notebook, ASUS has released the new N82J with a complete range of features that make it an ideal choice for consumers on the look for a powerful machine to do their media content, productivity and entertainment justice. The N82J comes with the sheer computing prowess of new Intel® Core™ processors and NVIDIA® GeForce® GT335M GPU, while memory can go up to a whopping 8GB. It fields the new, super-fast USB 3.0 for ultra-expedient data transfer speeds, as well as a range of exclusive video and audio enhancements and the energy efficient Super Hybrid Engine. These put the new notebook firmly in the performance bracket for every use and application. The prime directive for high-end N Series notebooks such as the N82J is multimedia performance. On top of powerful hardware, it fields an extensive list of refinements that bring out the best in entertainment and gaming. The innovative ASUS SonicMaster completely overhauls audio on a notebook PC with custom-built Altec Lansing speakers and thorough software processing of all sound output, resulting in the kind of surround fidelity consumers typically expect from full-price and full-size audio systems. Spectacular vocals, extra wide range and spot-on reproduction take sonic enjoyment to a whole new level. Complementing this, the N82J delivers amazing visuals with the help of ASUS Video Magic, a video amplification suite that accelerates frame rates up to 72FPS, thus eliminating blur. It also upscales DVD content to 1080p HD in real time and with no system strain. The related ASUS Splendid Technology refines image quality further, bringing out the most vivid colors and accurate contrast and brightness ratios available. Both work together with advanced NVIDIA® CUDA GPU computing to boost overall performance and reduce system power demands. N82J notebooks also come with the ASUS zero-bright-dot guarantee, which underlines the company’s grueling quality checks for all LCD panels it makes and ships. 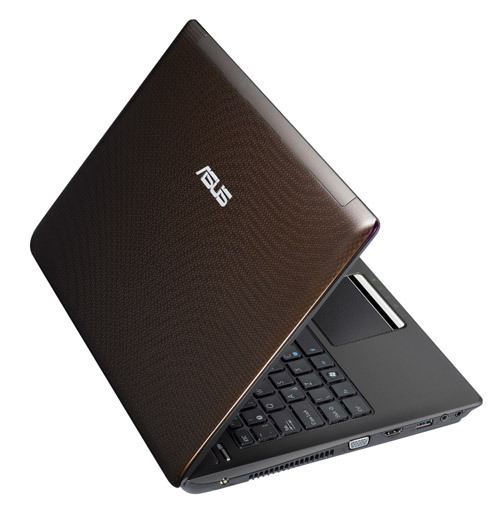 USB 3.0 is included on all N Series notebooks from ASUS, and the N82J is no exception. Users benefit from super-fast file transfers and data backup, at up to ten times the speed of USB 2.0. The implications are clear – in an age of ever-larger HD content, the need for speedier data connectivity goes without saying. USB 3.0 makes it possible to transfer a typical MP3 song in just 0.01 seconds*, while an entire 25GB Blu-ray disc takes only 70 seconds. Thus, the N82J accommodates users in empowering their lifestyles and work environments. Despite all its bountiful features and superlative performance, the N82J is no back breaker, and retains a slim and stylish pose. It’s a light and slender machine that can be easily carried and moved around to meet the very mobile demands of contemporary users. N82J retains the ASUS focus on eye-catching design with its luscious patterned cover and tactile light alloy exterior. The quality feel of this notebook reaches to the multi-touch pad and palm rests, which are generously-sized for superior comfort. Several energy-conserving features have been fully implemented on the new N82J to ensure its environmentally-savvy stance and long battery life. The exclusive Super Hybrid Engine from ASUS manages system resources to ensure just the right amount of power is consumed based on tasks and applications carried out. This results in power savings and lower carbon emissions—good for users, good for the planet. NVIDIA® Optimus™ technology also contributes to the N82J’s harmonious mix of power and green values. This intelligent graphics manager switches between the dedicated GeForce GT335M GPU and integrated graphics depending on the intensity of visuals being rendered at any given time. For high-end gaming and image processing, the GPU goes on. For normal tasks with no demanding visuals, integrated graphics are used. This leads to significant power savings and a much longer battery life. N82J is another cutting-edge all rounder from ASUS that offers a bevy of features to users who like their multimedia fast and stylish—yet compact and eco-friendly. *USB 3.0 speeds quoted are based on component specifications. Actual speeds may vary by configuration and devices used.